At just over 76,000 tons, the Aurora is one of eight exquisite luxury cruise liners operated by UK-based P&O Cruises. With accommodations for more than 1,800 passengers and nearly 1,000 crew members, the Aurora is equipped with three swimming pools, a spa and health club, as well as a cinema, theater, and several entertainment venues. First launched in 2000, the P&O Aurora recently underwent a three week, £26-million dry dock refurbishment in Hamburg, Germany. First launched in 2000, the ship recently underwent a three-week, £26-million dry dock refurbishment in Hamburg, Germany, overseen by Richard Parker from Miami-based FUNA International. 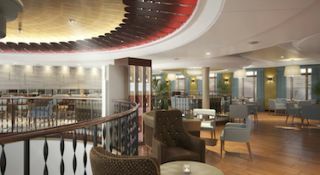 As part of the renovation, FUNA brought in audio consultant and designer Peter McBoyle of Stratford, Ontario to design and specify sound systems for the ship's three main venues. Located in a prominent location midship on Deck 7, The Masquerade Lounge is the third-largest venue on the ship and one of her most popular halls. Home to the ship's nightly disco, the Masquerade is also used daily for live music, comedy, lectures, and other presentations. When not hosting an event, the Masquerade functions as a lounge and meeting point for guests. As McBoyle explained, that need for versatility played a role in his decision to go with Renkus-Heinz CF Series loudspeakers. "They needed a system that could deliver high-impact musical performance from the small stage area for dancing and for live music, but could also function at lower levels for background music during the day," McBoyle said. "It also had to provide good intelligibility for spoken-word performances. And it had to be consistent across the entire venue, without blowing anyone away." The Masquerade Lounge is outfitted with left and right arrays of Renkus-Heinz CFX101LA modular point-source line array loudspeakers, two cabinets to a side. Ground stacked beneath the flown arrays are a pair of CFX 218S dual 18-inch subwoofers to provide low frequency punch. Reinforcing the main arrays are two rings of delay fills—the first comprising five CFX81 loudspeakers, and the second ring of three more CFX81 cabinets—to keep coverage consistent and intelligibility high. Augmenting the main system, McBoyle specified four CFX121 cabinets facing inward onto the dance floor. "Those speakers are primarily used when the room is in Disco mode, but they can also provide foldback for the dance floor area if needed," he said. A pair of CF121M cabinets are employed as stage wedges. QSC amplification powers the system. A Yamaha QL1 digital console handles the mix, connected via Dante to a Media Matrix NION NX that handles system DSP. The Masquerade Lounge is outfitted with left and right arrays of Renkus-Heinz CFX101LA modular point-source line array loudspeakers, two cabinets to a side. Ground stacked beneath the flown arrays are a pair of CFX 218S dual 18-inch subwoofers to provide low frequency punch. The CF Series' tight pattern control was well suited to meet the challenges of the room's low ceiling height, McBoyle said. "The directionality of the CF101LA cabinets gave us a controlled 30-degree vertical HF coverage, which allowed us to avoid unwanted reflections off of the ceiling." The project was challenging on a number of levels, including tight budgets and even tighter scheduling. "Considering the scope of the work involved in this project, the schedule was very ambitious," said McBoyle. "The dry dock overhaul was only 20 days long, and that included almost every aspect of the ship. There were contractors everywhere, all working on top of one another. Speakers were being installed while the floor of the disco was being ripped out and restored." Elsewhere in the ship, McBoyle specified 17 CFX12S compact subwoofers for Carmen's Lounge, another major venue onboard. "The small form factor of the CFX12S worked really well for the limited space we had available," said McBoyle. Six CFX121M wedges are installed on the stage as monitors.